Ok, remember when you bought your TIE Advanced and immediately threw away all the pilot cards except Vader because they paled in comparison to the awesome power of the Dark Side? All right, maybe you kept those other cards, but you tell me, how much do you use them? Right. As I thought. 98 hands for Vader, 1 for Maarek Steele, and one guy talking on his phone while tipping back a frosty TheMetalBikini.com mug who was unable to vote. I think the HWK-290 is going to be largely the same way. Full disclosure, I've only read the Mr. Roark card a couple of times and haven't even really thought about how to apply it, but Jan leaves me wanting a bit compared to Mr. Jedi Knight II: Jedi Outcast (too bad it's not Jedi Outkast, amirite?) himself, Kyle Katarn. Ok, so stats are nothing special as usual- a HWK-290 with a Pilot Skill of 6. Not terrible, not great- firmly middle of the road and not insulting for a named pilot at 21 points. 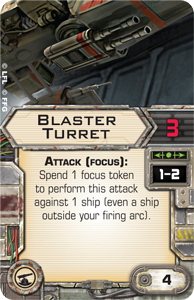 Right, so card text- a bit like Garven Dries at a glance because you see the words "Focus Tokens", but past that, they're actually fairly dissimilar. I saw a lot of people saying no one would bother with Dries after Katarn showed up. Admittedly, not knowing the dial for the HWK-290, I think it's hard to say definitevely either way, but as I mentioned, they actually do kinda differ in their application if the end result is essentially the same- giving someone else a Focus Token. First and most significant difference, Dreis gives his away when he uses it, Katarn just gives his away at the start of the Combat Phase. Katarn's version also goes out to Range 3 where Dreis stops at 2. So here's where the lovefest begins and why I say you can probably pitch the pilots besides Katarn. Ol' Kyle has the same upgrade icons that Jan does- the turret weapon, the single Crew Member and the Elite Pilot Skills medal. Right on. 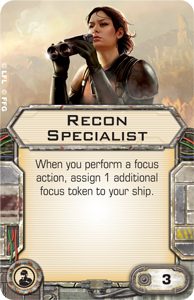 First, Recon Specialist is the obvious choice for Katarn's Crew Member. Perform a Focus Action, net two Focus Tokens? Sign me up. Second? 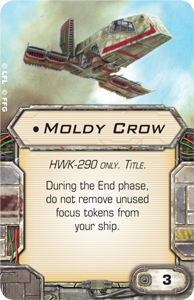 HWK-290 title, Moldy Crow. There's really nothing to even compare this to. I want to say, "Now your Focus Tokens are persistent like your Target Locks", but it's better than that obviously, because you can only have one Target Lock at a time (without Weapons Engineer, of course) and Moldy Crow allows you to bank Focus tokens... I guess indefinitely. As for the Elite Pilot Skill, ideally you want to be Focusing as your Action every turn to max the return on investment of Recon Specialist and Moldy Crow, so don't take anything that involves an Action- Marksmanship, Expose, etc. Instead, since you're going to be quite the target throwing around Focus Tokens like they're beads at Mardi Gras, consider Determination or if you've got some change left over from your 100 points,another passive Skill that increases your survivability while not eating up an Action- maybe Elusiveness or Veteran Instincts. Or I don't know, maybe nothing at all from the Elite Pilot Skills. Like Jan, I think a turret weapon is kind of an auto-include with Katarn as well, and I'd probably opt for the Blaster Turret over the Ion Cannon Turret, though just by a smidge. For a Modification, I'd strongly suggest Shield Upgrade as again, you're going to be a huge target for your opponent, and not being a particularly tough nut to crack to start with, there's little reason for him to not attack Katarn should he want to though a compelling case could be made for Engine Upgrade for the same reasons I mentioned yesterday with Jan- the best defense possible is not even being in your opponent's firing arc. Now, is it worth using your Perform Action step on a Boost instead of a Focus with Katarn? Well, it probably is if you're about to get shot out of the sky by a Range 1 Interceptor or something. Is it worth it compared to a Shield Upgrade? Depends on if you're good at using Boosts. This Katarn configuration (KK + Recon Specialist + Moldy Crow + Blaster Turret + Shield Upgrade) comes to a cool 35 points. It ain't cheap, so at some point you may want to stop and ask yourself, "Is this worth it?" I've been thinking about it- it being Katarn's card text, and I kinda think maybe it is. This is probably not at all viable, but I kinda look at it the same way I used Dreis in that Lando/ Dries/ Goldie list I made a long time ago. 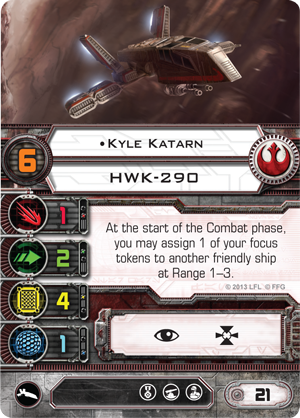 I also think it would be crazy, but that Katarn might work with some A-Wings because they have so many other fun Action things available and one of them could still pick up an extra Focus token every turn as well. In any case, it sure seems worth it on paper, at least. I think even if this build doesn't work out as awesomely on table as in theory, Katarn would be fun to fly, in any case. Also, this particular incarnation of the HWK-290 may be significantly more hearty than other versions when configured somewhat similar to the above. Generating two Focus Tokens per turn without having to discard them in End Phase is going to build up quick. I've never playtested a ship that could Focus on defense against each salvo of fire from say, three or four different ships after the second or third turn and still potentially build up more going forward, but I have to imagine it does increase the survivability pretty noticeably. I mean, yeah, you're still only rolling one green die, but that green die is going to help you more often than not if you're Focusing it every time you roll it. And hey, look at it this way- if your opponent is shooting that often at Katarn, yeah, he may not have Focuses to give away, but if you're kind of using him as either bait or a Focus gifter, either way, he's doing his job- either buffing up your other ships, or drawing fire away from them letting them roam freely amongst your opponent's ships. 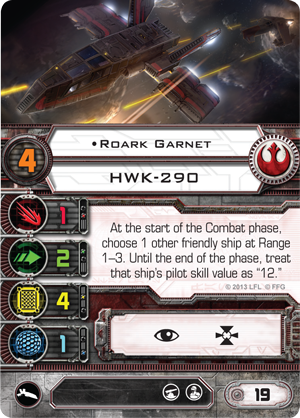 Imagine buddying up with a Chewie Falcon with Draw Their Fire and some other random ship or two to round out your list- those ships are likely to be on-table for a good long while for one reason or another.